Nebraska is an agriculture state — our economy is not powered by oil and gas development — therefore, big fossil fuel energy projects like tarsands pipelines are bad for our land, our water and our economic activity. We do not want to see them built. We want to see investments instead in clean, American-made renewable energy. Nebraska needs to enact stronger protections for our land, water, and citizens at all levels of government. Bold Nebraska works to empower citizens to pressure local, county and state boards to enact proper protections against risky pipeline projects, to protect our land, water and citizens. The State of Nebraska needs better regulations in place to oversee potential tarsands pipelines, including an Emergency Response Plan for tarsands oil pipelines like TransCanada’s Keystone 1 pipeline that is already in the ground in the eastern part of our state. Companies should also be required to disclose the contents of what exactly is flowing through their pipelines, so that citizens and emergency responders are equipped to handle a leak or spill. The “MSDS” (Material Safety Data Sheets) that companies that transport hazardous materials are required to maintain need to be immediately available to citizens and first responders when there is a spill. We also want to see our state put in place routing regulations, stronger eminent domain laws, and financial responsibility for any future pipelines. The State of Nebraska should also consider establishing an “energy corridor,” so that our state does not have its valuable natural resources put at risk by pipelines zig-zagging across our land. All levels of local government have the ability to enact laws that require proper routing and siting of pipelines; processes on abandonment of the pipeline; emergency and spill response plans; bonding of road use and other insurance issues; liability of spills; and regulation of neighboring land uses. Landowners have NO legal obligation to sign anything with a pipeline company or its land agents, and you don’t need to return their calls. If you are a landowner and are approached by a pipeline company’s agents or their contractors, and if you are unsure of your property rights, do not sign any documents produced by the pipeline company. You have no legal obligation to allow anyone from the pipeline company access to your property. They have no permits or approved routes in place and do not have the right to access your property without your permission. If you say “No,” they must leave you and your property alone. The Pipeline Safety Trust has an excellent Landowners Guide on dealing with pipelines and your rights. There is information on gas and oil pipelines in the guide. Do not even take phone calls from the pipeline company or any “land agent” or return them. Silence is the best option at this point. Keep all written correspondence the pipeline company sends and keep it organized in chronological order. Do not be lured into any verbal conversations. 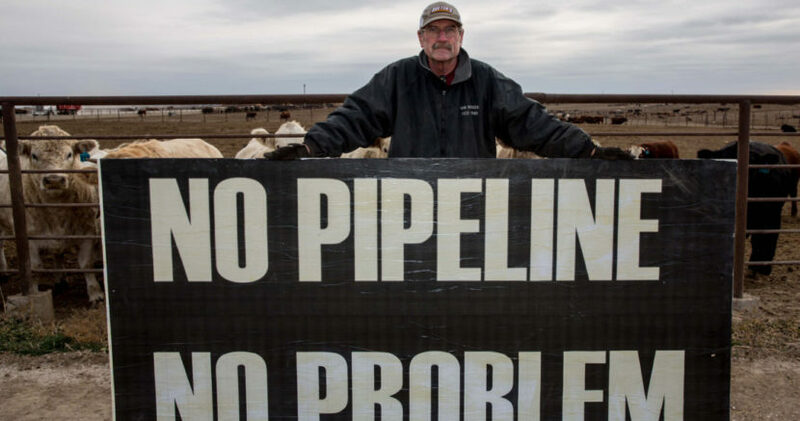 Force the pipeline company and any “land agent” to put any and all requests in writing. Record all oral exchanges with the pipeline company representatives and contractors. Ignoring them is the best option. They have no right to come on to your land. If they do, call the local authorities and file trespassing charges against them. If you do want to talk with the pipeline company or a land agent, its best to tape record the conversation (with something like this for landlines and this to record in-person conversations) or have a friend/family member with you so they can take detailed notes. Make sure you write down the land agent’s name, phone number and the date you had the meeting. Citizens have the power to change regulations, here are some ideas and advocacy briefings for safer pipelines. Dr. Stansbury, at the University of Lincoln, wrote a paper on the worst case scenario and possible spills. The report includes information about chemicals in tarsands. The federal government and our state government do not have the proper laws in place for oil pipelines. Here is one study on risks to the Great Lakes region. Bold’s goal is to hold Corporate Ag responsible and accountable for protecting our land and water, and require them to complete third-party environmental studies on projects that will impact local communities.